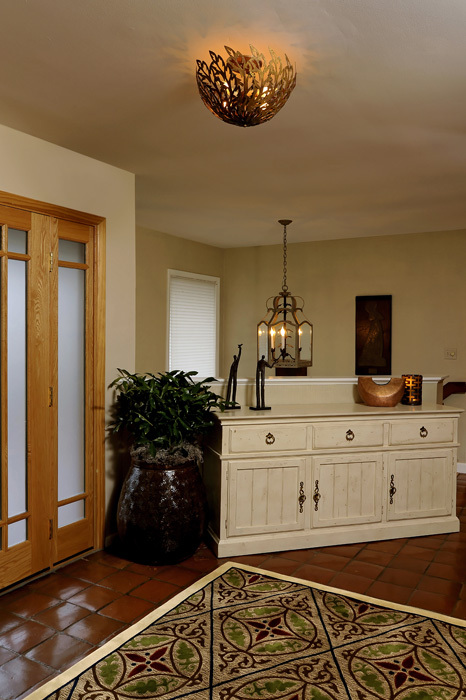 Our experience over the years allows us the ability to give you custom solutions to your design challenges. Family Room Bookcase: Custom built-in bookcase, floor-to-ceiling with integrated accent lighting. This bookcase unit provides valuable display & storage that is in proportion to the scale of the high ceiling & large open room. 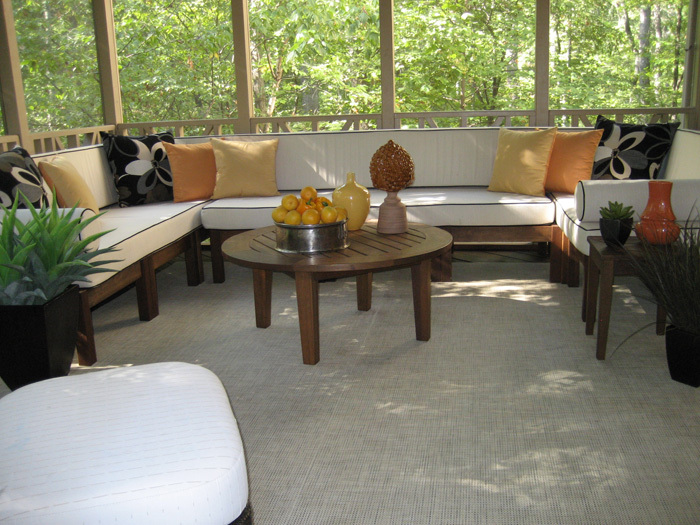 Family Room Coffee Table: Custom coffee table with granite top and hand-forged iron base. 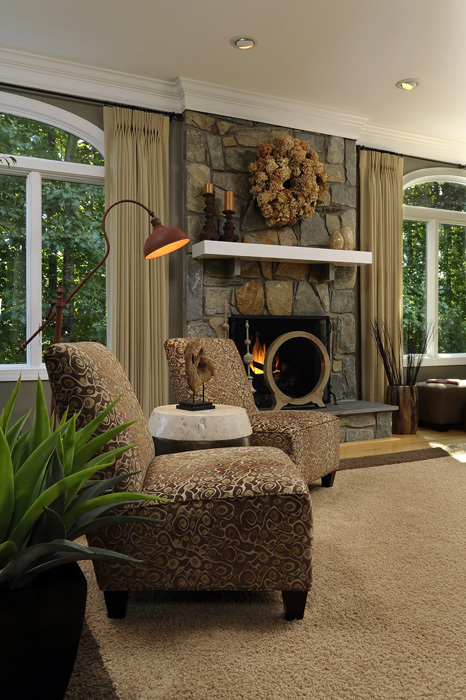 The rich, warm granite nicely complements the fireplace fieldstone. Living Room TV Cabinet: Custom built-in TV cabinet with rice paper doors and integrated accent lighting. The niche above displays the client’s personal ceramic collection. 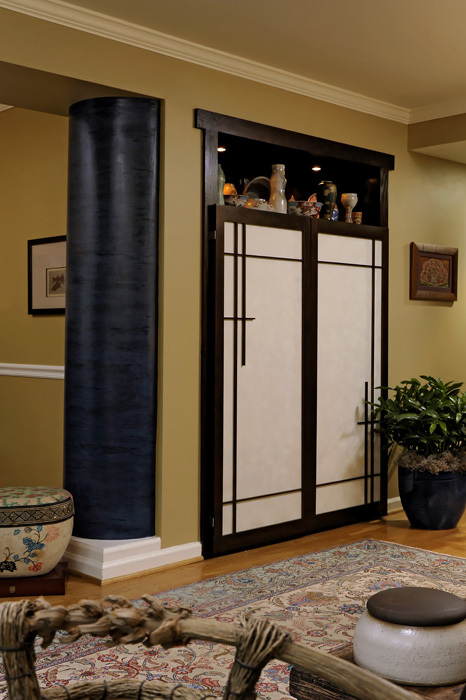 Note the dark blue architectural column faux - painted in a silk texture. 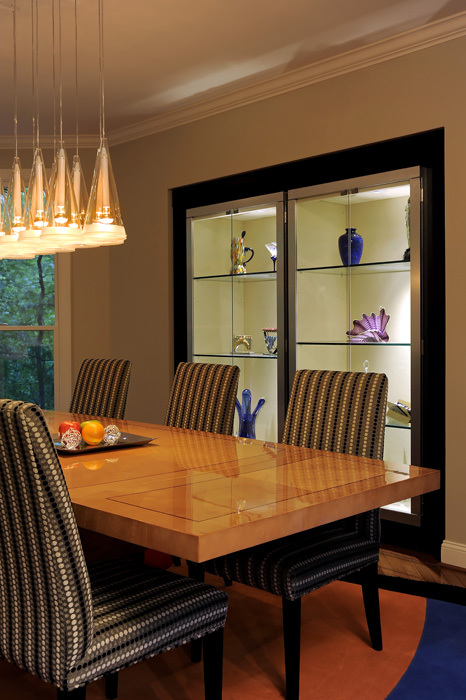 Dining Room Cabinet: This custom built-in cabinet displays the client’s glass collection. The space was previously an out-dated butler’s pantry that was totally unused. We designated additional space from this pantry, that was behind the Dining Room cabinet, as a storage room for kids’ toys that opened out into the adjacent room. A win-win for usage of space! 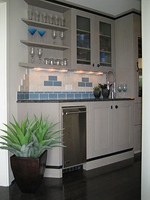 Lake House Beverage Bar: Custom tile backsplash design. Soft blue glass accent tiles are combined with an ivory color tile background, nice complement to the serene gray cabinetry. Perfect for a sanctuary Lake Home. Dining Room: This custom rug highlights the client’s glass collection with curved bands of bright colors and a thick “shag” border for contrast. Very dramatic! 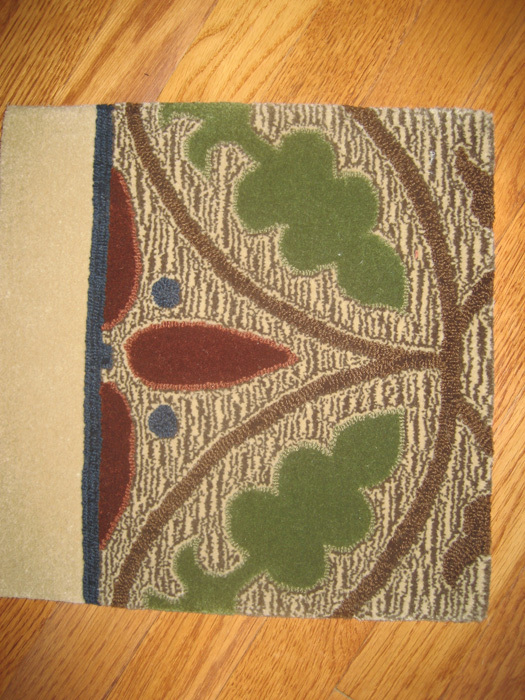 Foyer: The custom rug in the foreground is an exquisite pattern in wool fiber that pulled together all colors on the main level of the home. We worked closely with the client to perfect the color choices, using corner samples as shown to achieve the successful final result. 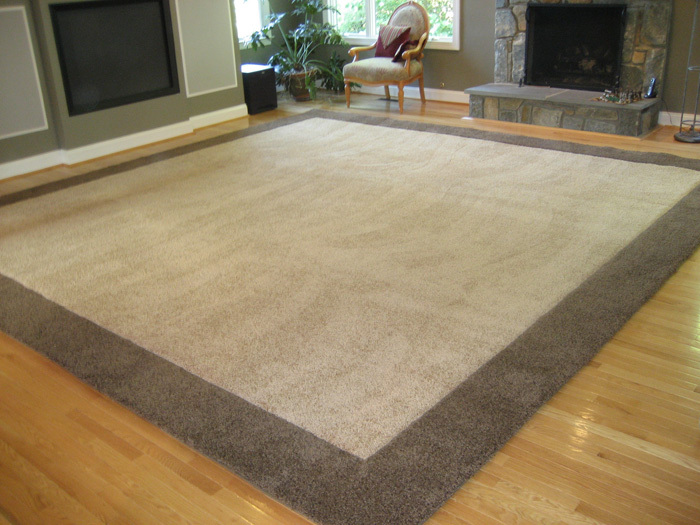 Family Room: A custom rug doesn’t have to be complicated — this rug is very basic and simple, using thick “shag” with a contrast border. The rug effectively anchors the furniture in this large room, and better yet, the colors were chosen to blend with the owner’s dog, for low maintenance! 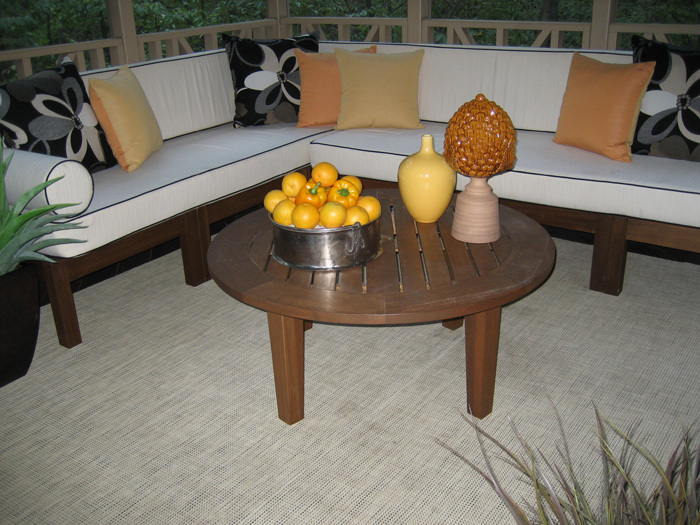 Porch: Here’s a custom-size outdoor area rug, in plynyl, a weatherproof and practically indestructible material, in an attractive basket weave texture. Faye Siegert Design, LLC, Phone: (703) 864-6136, Fax: (703) 263-2179, info@fayesiegertdesign.com | Base Content Copyright © 2019 Market Hardware, Inc.